Labette County sheriff, C.B. 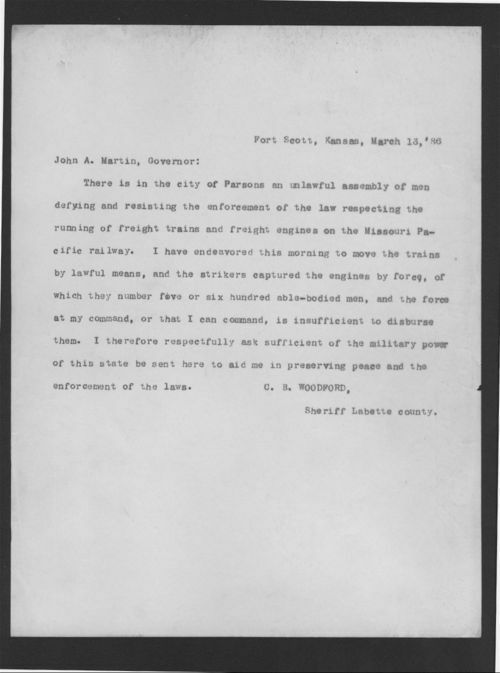 Woodward, tells Kansas Governor John Martin of Topeka he is unable to control the strikers who have captured the train engines by force. He is requesting military support. In February 1885, railroad shop workers walked off the job because of a cut in pay and reduced hours of work. Governor Martin was able to negotiate a settlement to the strike but problems continued throughout Kansas, Missouri, and Texas.